Going to a music festival this season? Make sure your hair is looking right. Here, we've got 20 styles to inspire your next look. Flower crowns are pretty and all, but with seas of them swarming music festivals from coast to coast, it might be time to reimagine the way you wear petals — or skip them altogether. 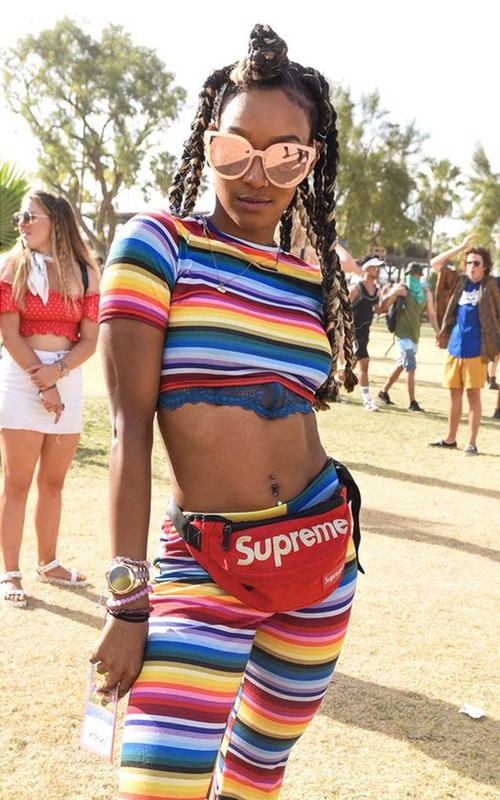 Yes, folks, it's time to switch up the swag and try new things when it comes to festival hair or put a remix on tried and true staples of the season (while trying to avoid any instances of cultural appropriation, naturally). Yes, this is the year to stand out and really get creative with your hair and serve some seriously double tap-worthy looks. 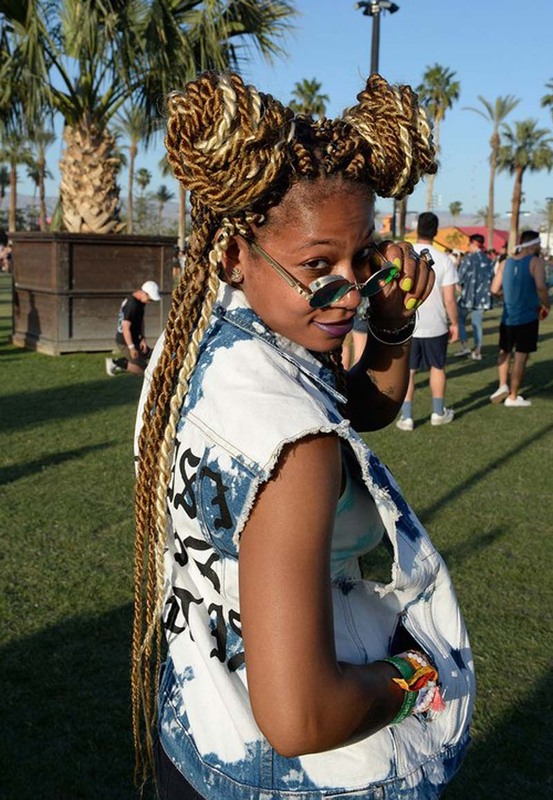 Here, we open your eyes to 20 eye-catching festival hairstyles — ranging from mega-long box braids and colorful accents to natural textures and glitter roots — that are sure to turn heads and get camera lenses snapping as you make your way from set to set. Why choose one look when you can incorporate many different styles into one? This creation by Sarah Potempa, hairstylist and creator of the Beachwaver, incorporates hair paint, charms, and an imaginative fishtail-take on a space bun. "After shampooing, prep your hair with Nexxus City Shield DD Creme as your leave-in conditioner to really help combat the humidity and outdoor weather," she says. To top it off and keep your texture poppin' all weekend long, she recommends using an anti-humidity spray like Living Proof No Frizz Humidity Shield or Mizani HRM Humidity Resistant Mist. Redway also reminds festivalgoers that not all products work for all curls, especially because of all the different densities and textures. "When trying out new products, test them out on the back sections of your hair just in case they may weigh your hair down," she says. The more color, the better. But if you're not ready to rock a full head of vivid hues to the office post-festival, rely on a semi-permanent hair cream or paint, like one from Manic Panic, for a look that will only last a few shampoos. Looking for a style that's easy to recreate? This fishtail accent braid by Potempa keeps your hair out of your face, while smaller braids and loose waves will add more texture to your overall look. Festivals are hot. This slicked-back pony with fluffy, colorful extensions braided in will keep you feeling and looking super cool. 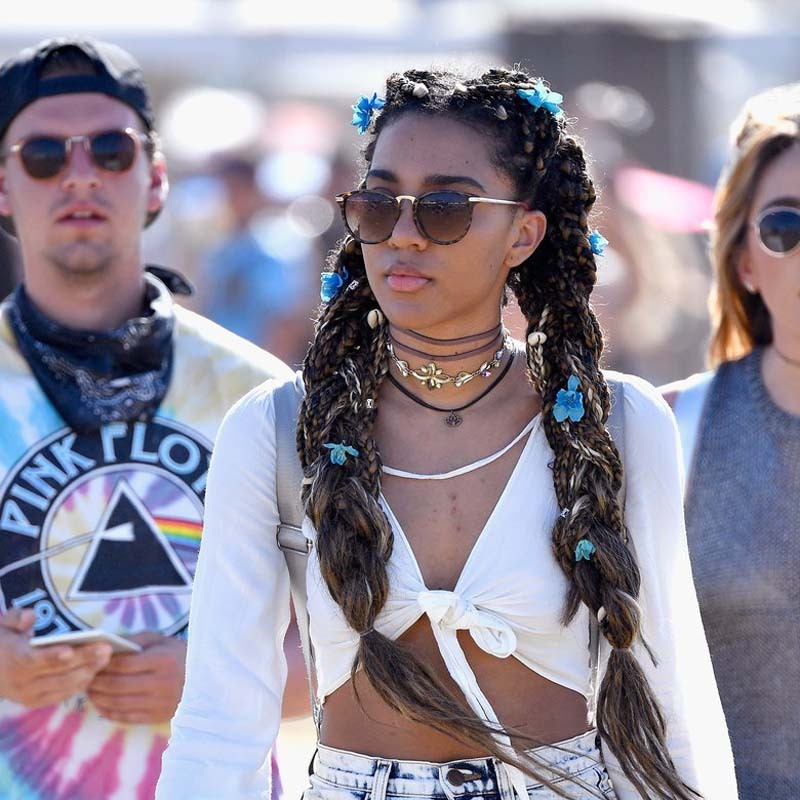 Worried about having to figure out a new hairstyle for every day of the festival? Relieve your stress with secure, color-accented braids. 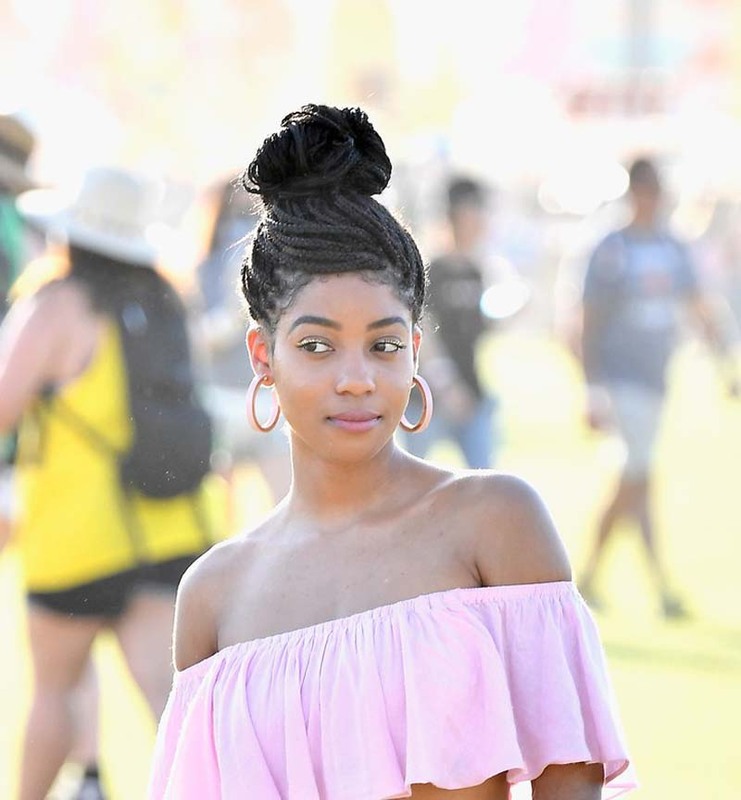 "Tight braids and twists allow you to get your hair done before you even leave for the festival," Gregory tells Allure. "You can keep the style in all weekend, without worrying about washing and fussing with it." Lady Stark can pull it off and so can you. 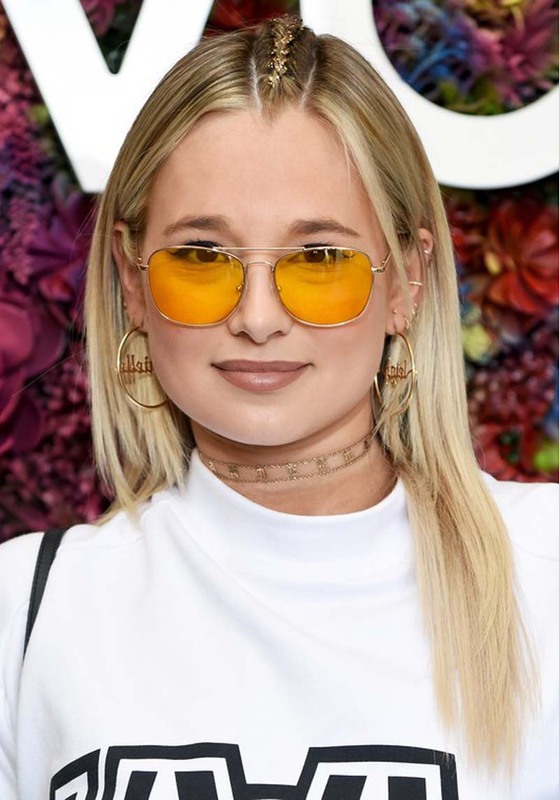 "The relaxed, rooted blondes and grown-out platinums — the 'I forgot to color my hair' look — that's what you're going to see everywhere this season," colorist Chelsey Pickthorn tells Allure. "Punk-ish bright tones and strong blonde rebel streaks, that's what we'll be seeing." 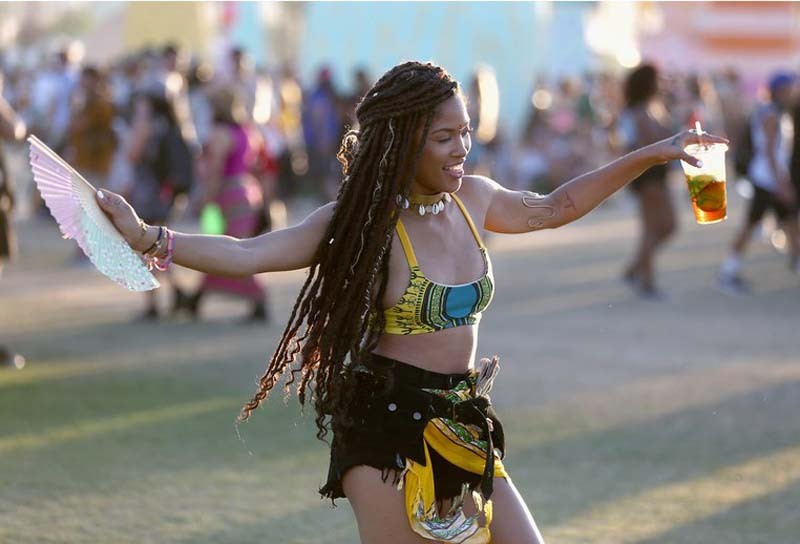 If you love the look of thick braids, you'll be glad to know they look perfectly in place during festival season, especially if you have box braids. This reveler braided hers up into two thicker braids and added some floral flourishes. If you want to embrace your natural texture, but make your look a little more exciting, a great way to do so is with a temporary hair color. As bleaching can cause stress on hair and tightly coiled strands are extra fragile, add some color with the Hush Prism Airbrush Spray, which even works on the darkest of hair. Messy, out of the way, and so Instagrammable, this Dutch braid combined with a messy bun is just what the doctor ordered. Glitter will forever be a festival staple. Unsure how to get the ultra-fine shimmer to stick to your roots? Gregory says to mix the glitter you want to wear with your favorite gel and paint it on with a thick makeup brush. Another super simple way to get the look? Crystal Casey, a hairstylist based in Virginia Beach, swears by IGK Preparty Strobing Glitter Spray. If you're not into glittery chunks, the Foamo Holographic Hair Foam may be right up your alley. If you don't have the patience for small braids, these larger ones are a great, lower-maintenance option. This festivalgoer wrapped one of her front braids into a giant Bantu knot, which is kind of reminding us of a unicorn right now. Faux locs are a wonderful way to experiment and keep your natural hair underneath protected. These mile-long locs are curled at the ends and adorned with cuffs and string to add a carefree oomph to her look. 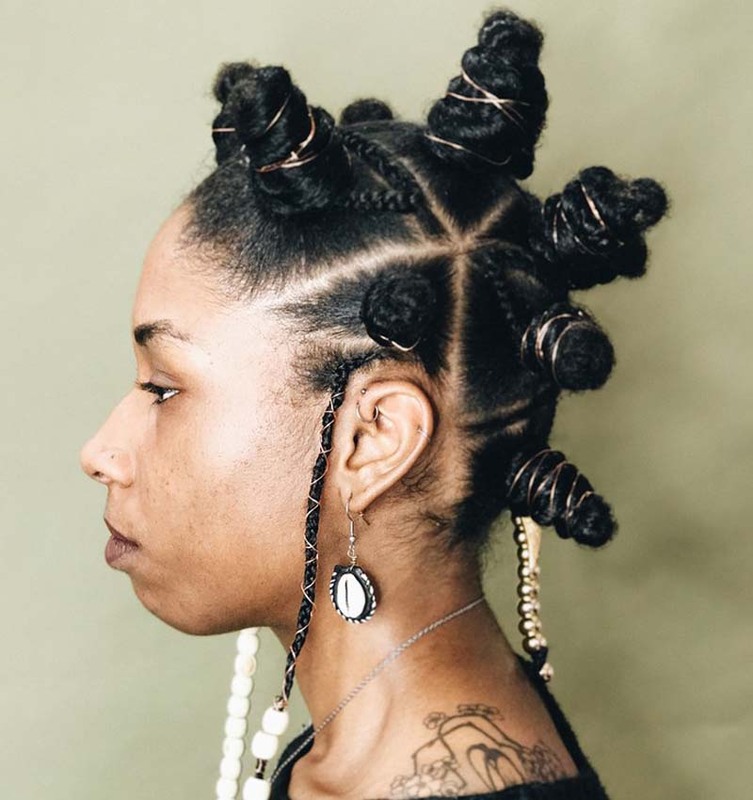 These jumbo Bantu knots are certain to earn you tons of double-takes at any festival. If you want to recreate the look, take the stylist's tips to heart. "We used rubber bands and braiding hair to twist the hair extensions in with the model's hair and then rolled them to create knots," Susy Oludele tells Allure. From there, just pop in a few hair accessories, like she did with these gold coils and beads, and you're ready. Glitter roots? Check. Bold, braided accents? Check. Messy space buns? You know it. 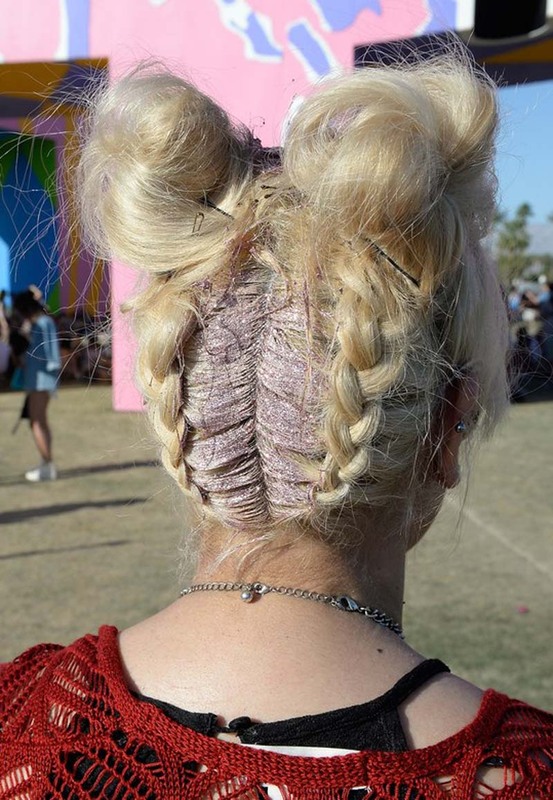 This festivalgoer's hair is up off her neck and ready to party. 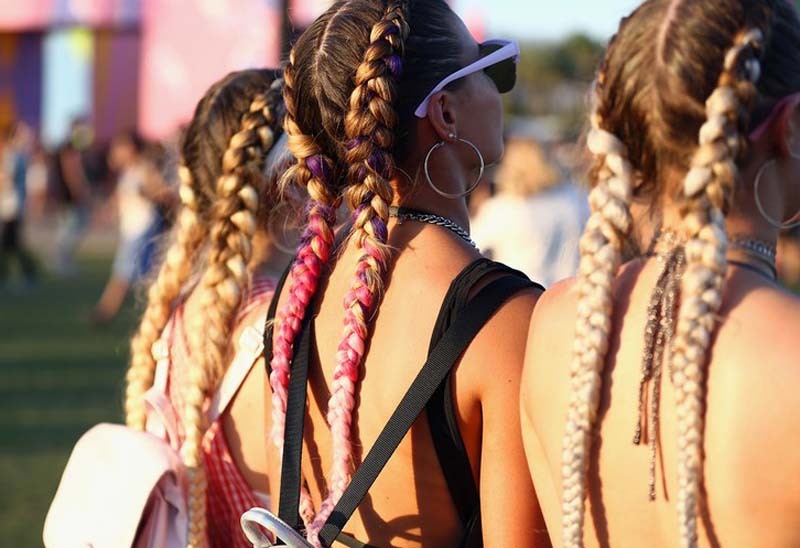 Who said festival hair has to be super out there? If you want to play up the rest of your look, pull your hair up in a forever-stylish high bun and you're ready to skip from set to set while drawing to attention to your 'fit. Box or triangle braids are a summer staple. 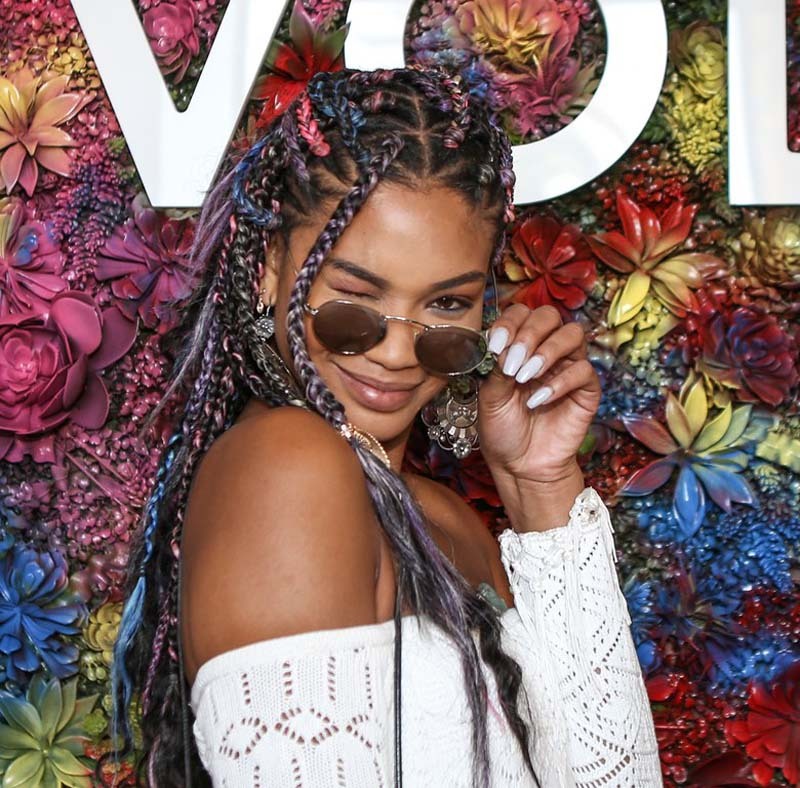 Jazz them up with a bit of color, or, as Chanel Iman demonstrates here, a lot of color. 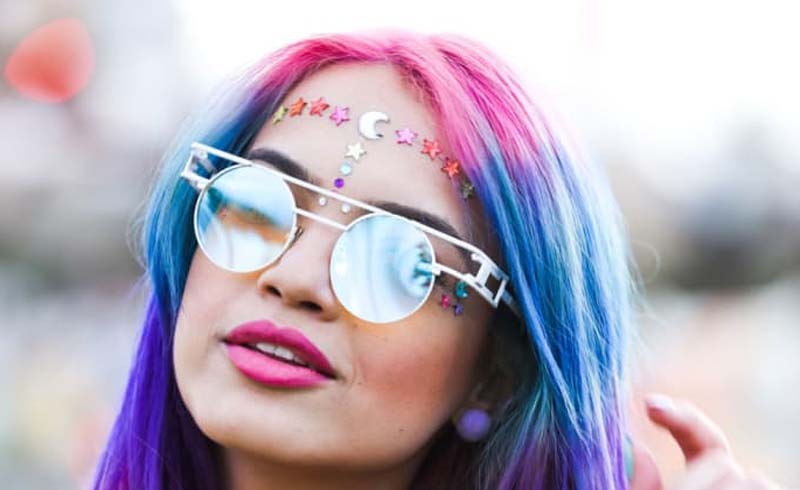 The model added pink, purple, and blue-colored extensions to hers, making for a the perfect festival feel. To ensure that your braids stay in tip-top condition all weekend long, Redway recommends investing in a silk bonnet and silk pillowcase. "Moisture will be your friend," Redway says. "You want to ensure you’re not drying out the natural and added oils to your hair with materials that are prone to do so like cotton." Space buns don't have to be space science. "Think a cross between grunge badass babe meets rave and Woodstock," says Pickthorn. 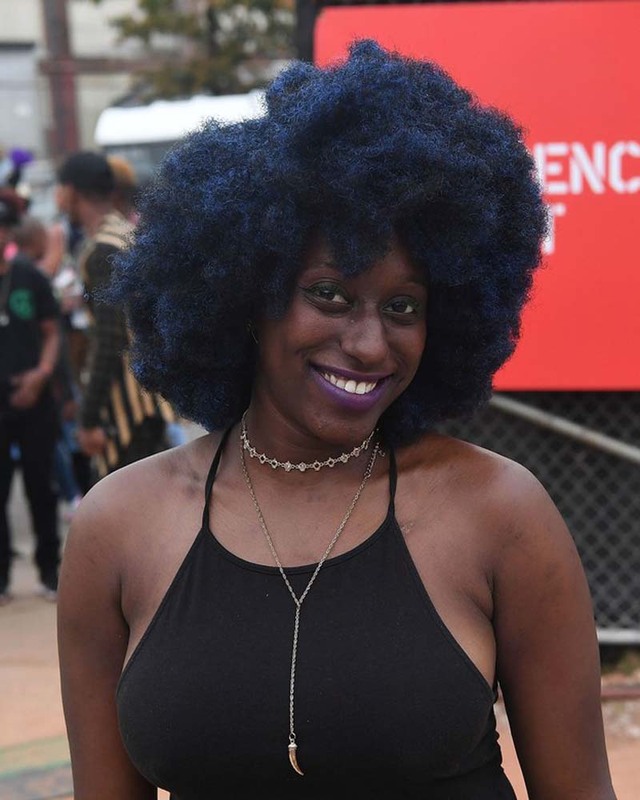 Here, this festival baddie put her Senegalese twists into two giant space buns, leaving a few strands loose in the back. Thinking of ways to stand out? Look no further that this bold braided part. Add some glitter if you're feeling extra. 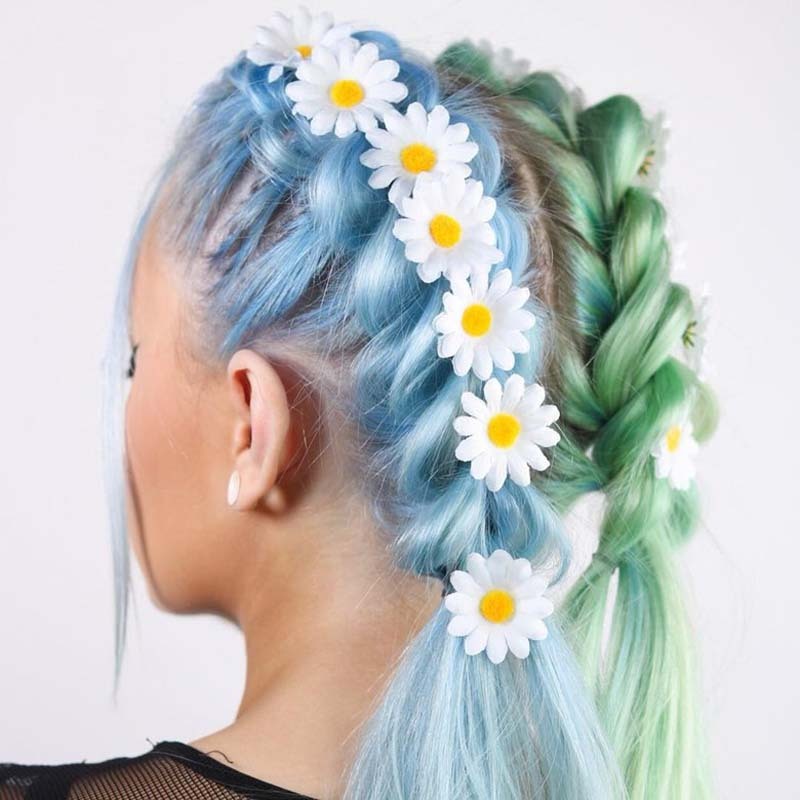 If you love petals but want to skip the flower crown, consider popping a few daisies into your hair instead. It's super simple and far less ubiquitous.